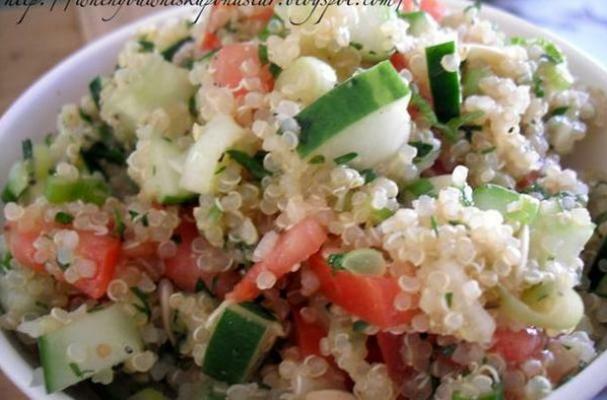 Tabbouleh salad is a mediterranean classic with cucumber, onion, herbs, lemon juice and bulgur wheat as its stars. This user-submitted gluten-free recipe uses quinoa as a flavorful substitute for the bulgur, which also adds healthy protein! Bring water to a boil in a medium saucepan. Add quinoa and stir. Cover and reduce heat. Allow quinoa to simmer on medium-low heat until all water is cooked off, about 20 minutes. Stir occasionally. Be careful not to burn your quinoa. Allow to cool. Place cooled quinoa into a large bowl (preferably something with an airtight lid). Add all remaining ingredients and gently stir until very well-mixed. Cover and refrigerate for at least an hour. Can be stored, covered, in the refrigerator for two or three days. But it's best on the first day, when the veggies are still fresh and crisp!